Smoker cabinets are an affordable option for replicating near competition level barbecue in the comfort of your own back yard. Camp Chef started out making grills and wood stoves for camping enthusiasts. A big part of their early market segment was hunters who went out on prolonged hunting trips or even lived for weeks at a time in a wall tent. 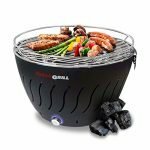 Since then the market segments they serve have expanded into a wide range of other outdoor cooking appliances. Yet they also make sure that if you need to, you can still take most of it with you in the great outdoors. 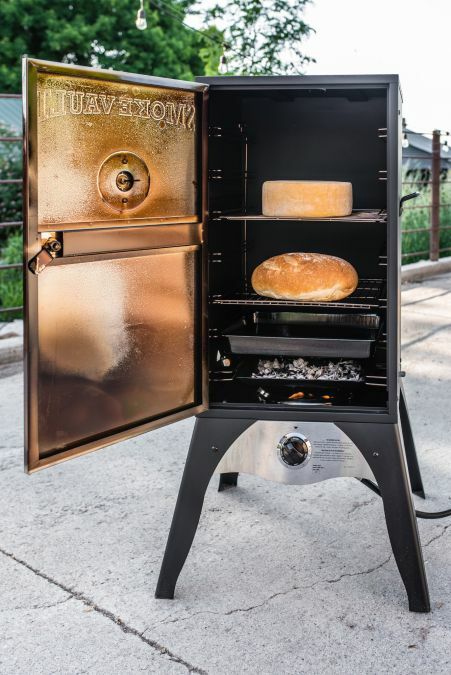 The Camp Chef 18-Inch Smoke Vault is their take on the classic propane-fired smoker cabinet. Indeed, there are a lot of small brick and mortar restaurants who will use smoker cabinets just like this for some of the dishes on their menus. As such, the Smoke Vault has a lot of the essential features you expect in a cabinet-style unit. At the bottom of the cabinet, there’s a propane element connect to a regulated LP hose. It is ignited by a built-in “Matchless Snap Ignition” system. The flame it produces heat a heavy-duty wood chip pan, which releases smoke along with the inherent heat of the element to cook and infuse the flavors of the meat. At full gusto, the element is capable of producing 18,000 BTUs of heat. This gives it a temperature range as low as 150 degrees and as high as 400! There are dampers at the top and on each side to help regulate the air flow, and smoke density inside the cabinet. An internal water pan helps add crucial steam, while also catching some of the errant drippings. The door also has a built-in thermometer to help you keep close tabs on the internal temperature. A big part of Camp Chef’s reputation and customer loyalty comes from their dedication for putting out quality products. You find this carries through with the SMV18S Smoker Vault. Quality components, welds, and fasteners are used throughout. However, the door thermometer isn’t perhaps as accurate as you want. It seems to get within 10 degrees. If you need to dial in the temperature of the meat any closer, then you might want to also invest in some sort of blue tooth or remote probe thermometer. Assembly is a breeze, and after unpacking it all carefully, you should be able to get the SMV18S Smoker Vault ready for its first use in under half an hour. Supposedly, there is a natural gas conversion kit available. However, it is very complicated to install, and once you make the change, the alterations to the base of the smoker vault won’t allow you to change back to propane again, without running into some serious air leaks. The high end of its temperature range means that you can indeed use the Camp Chef Smoker Vault like an indirect heat grill. One could even argue that it can do a lot of the things you see in a much more expensive wood pellet grill. At first glance, the fact that it only comes with two racks feels a little bit like a shortcut. There are indeed other competitor smokers in relatively the same price range, that offer four and even five racks. However, these other units tend to struggle with things like heat load and even smoke distribution. Half the time you find yourself removing the extra racks just to have enough space to smoke the two or three tall things you want to use it for. Each of the racks measures in at 14-inches by 15-inches. This is more than enough space to smoke some pork shoulders or even a modest sized brisket. If you want to smoke multiple racks of rib, I would suggest cutting them down into three rib portions. When laid out carefully, you should be able to get up to four racks of spare ribs in it. You can also use the Camp Chef Smoker Vault for smoking homemade link and ring sausages. Just set one rack at the top, and then tie off the sausages with butchers twine. The heavy-duty wood chip pot might be better served by using half wood chunks. If you do use chips, soak them overnight in water. This will add some extra humidity, reduce flareups, and allow them to smoker longer, without having to reload. It’s also worth noting that Camp Chef also provides tips and simple instructions in the user manual. Each grate is 14-inches by 15-inches for 201 square inches of space per rack. The “Matchless Snap Igniter” is nice, and not something that you find in all propane smoker cabinets in this category. Smokers are typically a little more work to clean, simply because the soot can build up throughout the entire cabinet. After scraping down the grates, you want to look for any areas loose soot on the top and sides. The last thing you want is soot from an old smoking session falling onto meat in a later smoker session. Take a look at the thermometer’s internal thermocouple. Soot and residue that builds up on this little probe can cause inaccurate readings. Camp Chef warrants the stove components to be free from defect in materials and workmanship for 1 year from the date of purchase. This also requires registration of the product after purchase. This level of warranty is a little bit under the competition, who tend to offer a 3-year limited or a multi-tiered warranty for cabinet smokers in the same price range. 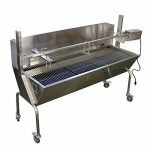 If you are looking for a cabinet smoker, then chances are you are having a hard time finding one that stands out from the crowd. This is in large part due to the simplistic nature of these cooking devices. While the Camp Chef Smoker Vault doesn’t stand head and shoulders above the competition, it does have a higher top end heat range. It is also backed by Camp Chef’s reputation for quality and customer service.